Here’s something different. I sent a little artwork to an unusual exhibition called Cardboard City which is starting in London tomorrow (Cardboard City was a collection of homeless people in Waterloo during the Thatcher years). Artists were invited to submit a piece that reflected social cohesion and community spirit. Each piece has been mounted into a makeshift cardboard box and they’ll be released into the wild during the lead up to Christmas. The first cluster is going out on the 1st December and then daily up until Christmas Eve, beginning somewhere near the original site of Cardboard City and heading along the Southbank, right up to the doors of the Tate Modern. The curator had a trial run today to see if people would open the box and look at the art – they did – and if you look closely at the picture you’ll see that it’s mine, with a lovely view of St. Paul’s Cathedral and you can follow the progress of the little artworks in cardboard boxes throughout December on Twitter here, or on the Collect Connect website here. 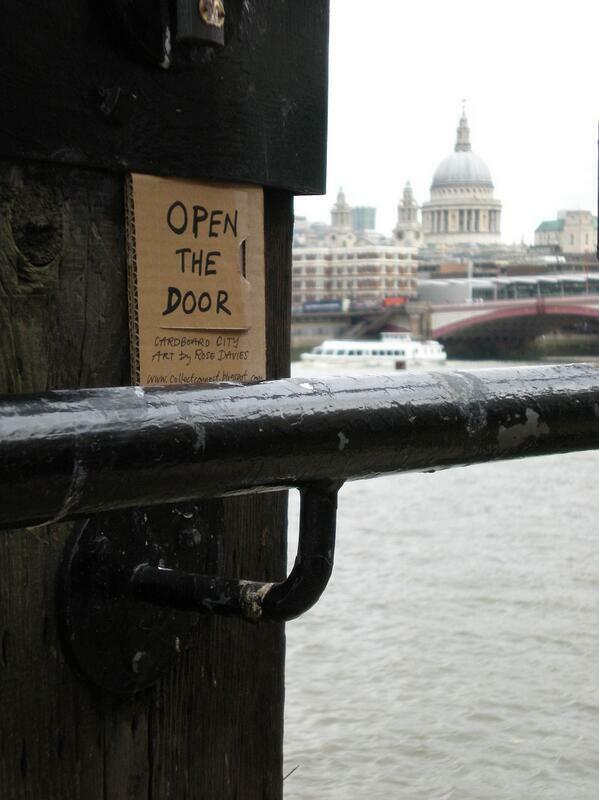 Or if you’re in London, go walkabout on the Southbank and enjoy these tiny bits of art. And apart from this, I’ve had a lovely day shovelling manure on the allotment – gnats still there despite it being nearly December – and watched a cracking rugby international on the TV, Wales vs Australia. We lost but it was a great game, tight to the end.